"The mission was a sham. The murders were real." 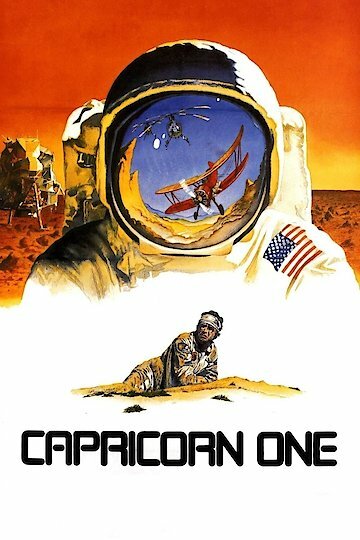 Capricorn One is a 1978 suspense film hosting a stellar all-star cast. The plot centers around a U.S. government space agency that conducts a pioneer mission to Mars. However, the mission must be aborted due to technical errors and the agency's inability to make the Mars project a success. Rather than admitting to failure, the governmental powers that be opt to fake the Mars mission from a makeshift film studio located in the desert. The astronauts, played by James Brolin, O.J. Simpson, and Sam Waterson, are informed by the space agency leaders that their lives would be put at risk to continue with the mission to Mars. In cooperation with the agency's wishes not to disappoint the public, the three men agree to create the illusion of walking on Mars from a secluded sound stage facility. However, the ruse becomes too much of a burden for the men and mistrust sets in against the space agency leaders. When the three astronauts inform the agency that they will no longer play the space game of deceit, they learn they are to be eliminated to keep the Mars mission a secret. The Capricorn One story moves at a fast pace and the action begins when the three astronauts make a run for freedom from their military-style quarters in the desert. Once they have been discovered to be missing from the base, an all-out military assault is order to search them out of the desert and kill them. Elliot Gould plays a quirky reporter named Robert Caulfield who puts the pedal to the metal when trying to unravel the mysteries surrounding the Mars mission. Caulfield will soon discover the desert sound stage and come under attack from the frantic space agency that's trying to maintain their cover. Capricorn One also stars Brenda Vaccaro, Hal Holbrook, Karen Black, Robert Walden, David Doyle and Telly Savalas. This film is rated PG and is appropriate for most audiences. Capricorn One is currently available to watch free on Tubi TV and stream, download, buy on demand at Amazon Prime, Vudu, Google Play, iTunes, YouTube VOD online.